Your family will feel the aloha spirit in this stunning oceanfront estate with two separate living quarters on the island paradise of O’ahu. You’ll have one full acre to enjoy space, freedom and everything this property and the surrounding area has to offer. The main home is available for parties of up to 8. If your party is larger, you may also choose the separate cottage, which accommodates an additional 2-6, for an additional $25 per person plus an additional cleaning charge of $200. Both homes are designed in old Hawai’i plantation style, with airy, vaulted bead board ceilings and lots of light and windows. Embrace indoor/outdoor living, with generous lanais overlooking the lush foliage, swaying palms and wildly beautiful views of the deep blue Pacific ocean. The gentle and ever-present tradewinds will keep you comfortable during warm, sunny days. A white sand beach beckons you to savor the natural beauty that is the island of O’ahu. Spend your precious days relaxing on a hammock, swimming in the ocean, snorkeling, surfing and soaking up the sun on your very own private stretch of beach. Located on the secluded Malaekahana Beach, where at any give time, you and your guests might be the only people on the beach! The main 3-bedroom home offers a spacious living room, with an abundance of comfortable furniture, a large dining table and a full kitchen, with refrigerator/freezer and stove/oven. Entertainment options in this home include a 40” flat screen TV/DVD and iPod docking station. The master bedroom boasts a king bed and a twin daybed, large bathroom and a private lanai with commanding ocean views. The second bedroom with a queen bed is located on the lower level adjoins an outdoor living area and lanai. The large third bedroom offer two twins, sofa and flat screen TV. This home also features a private outdoor shower. The separate cottage offers an enormous great room area, with vaulted ceilings, fans and an abundance of delightful natural light. This room offers two queen size beds, the living area with a 40” flat screen TV/DVD and iPod docking station. You’ll also find the dining table for 4 and the kitchen with refrigerator/freezer, stovetop and sink. A small separate bedroom houses a queen size bed. 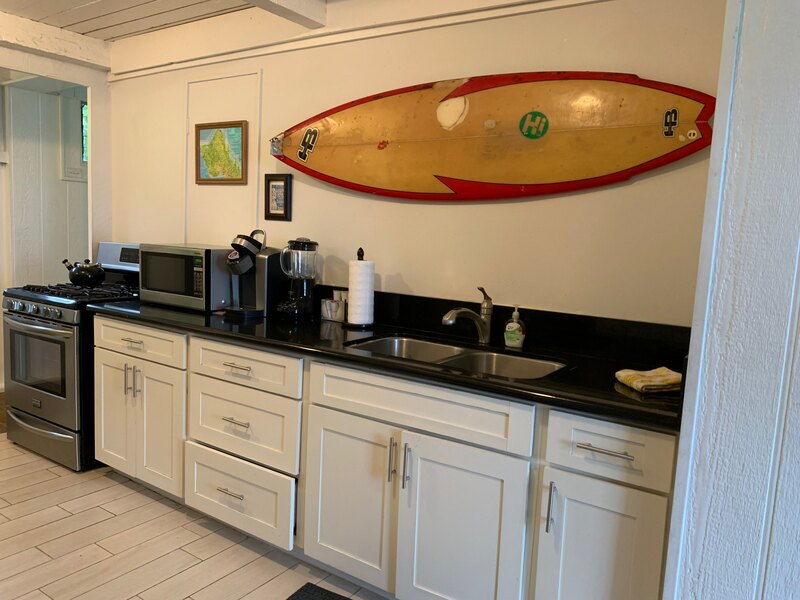 You’ll make special family vacation memories at the Malaekahana Beach House estate on the stunning Hawai’ian island of O’ahu. Some and experience the natural paradise that has tempted vacationers for generations and maybe you’ll start a new tradition of your own. Malaekahana Bay has a long white-sand beach, which makes it perfect for beach walks, ball games and relaxation. It offers good bodyboarding and surfing opportunities. Located just offshore on the southern end of the bay is the small Mokuauia Island, also known as Goat Island. If you are eager to explore it and want to be on a secluded island all by yourself, you can swim over, take a body- or surfboard with you or when it’s low tide, simply walk over because the water is flat enough. Just put some reef shoes on to prevent cuts on your feet. Goat Island is a real hidden paradise. It has a white, sandy beach and green sea turtles can be spotted in the area. The most memorable family vacation EVER! I am so happy to hear that you had a wonderful stay and found the home to be comfortable! We constantly work towards guest satisfaction . We greatly appreciate your review as well. Great all around trip and the property was exactly what we were looking for. If you want a little funk with seclusion, this place and location can't be beat. It's definitely a tad bit outdated but that added the character.